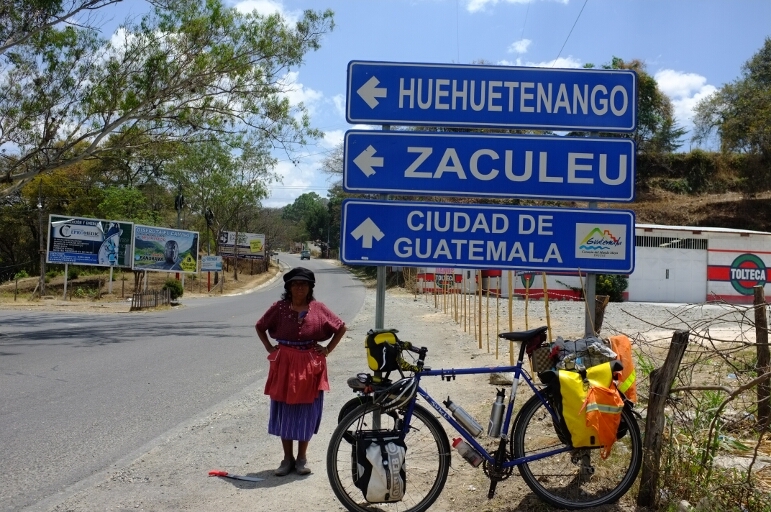 I stop along the road to snap a photo stating the name of the city we will spend the night in. I hold the camera to my eye and when I look through the viewfinder, a woman is posing beside the sign. 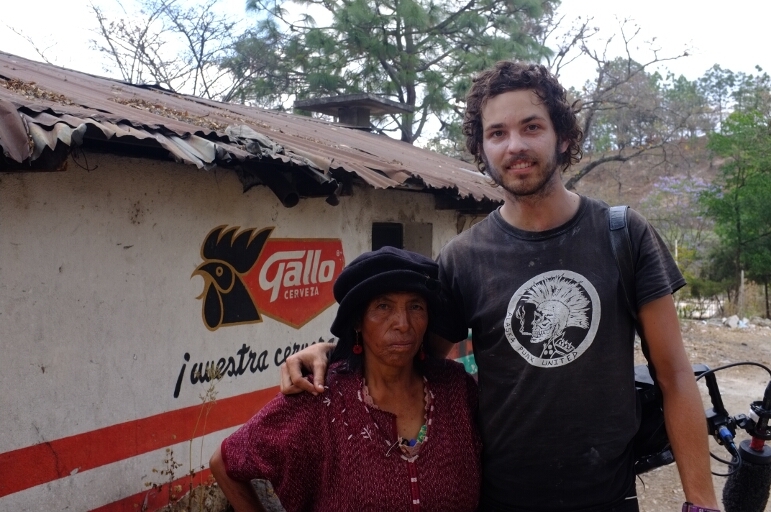 I’ve been photo bombed by a Guatemalan Indigenous women! She asks me if shes beautiful and requests another photo. I’m happy to oblige. 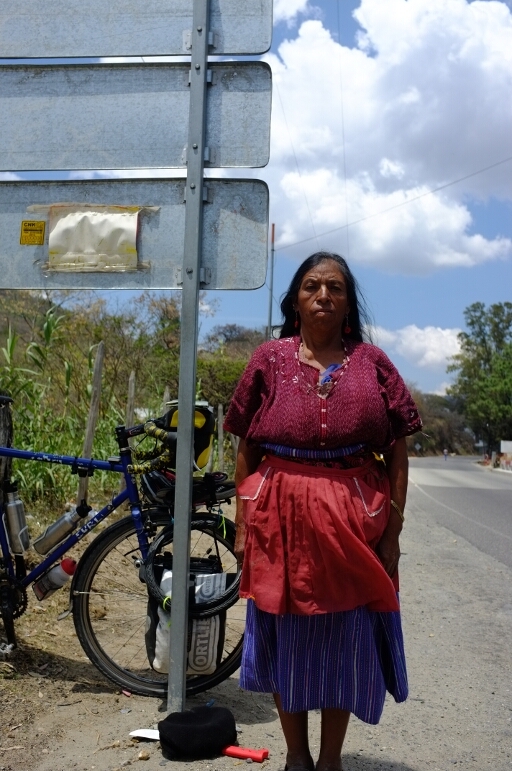 As I raise the camera to capture another moment, a machete falls from her blouse. She tells me a story waving the machete as she speaks. She was robbed at gunpoint by bad men. They killed her chickens and stole her cow along with most of her possessions. Her name is Rosa Marie. The machete is clearly new. The sticker on the blade is unscratched and the instrument still shines. She bought it to protect herself from men. She hates them. A bus drives past with a man hanging out of the door. 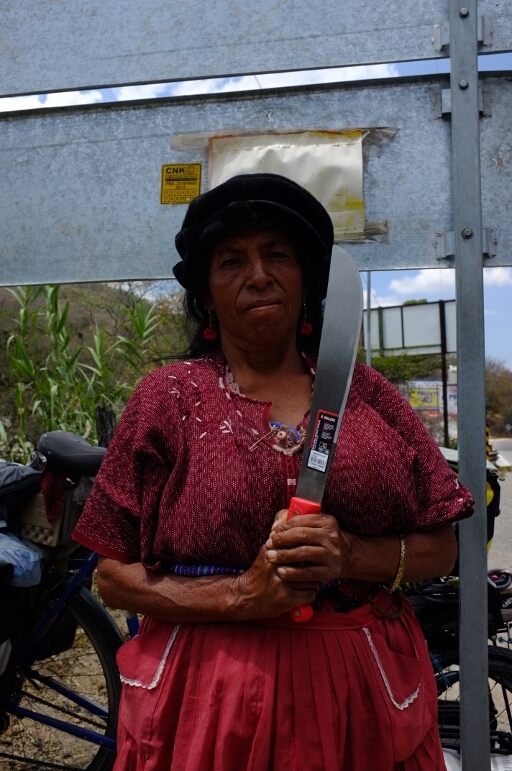 She points the machete, “No me gusta hombres.” Her face trembles as she speaks remembering the men with pistolas. Her hatred hovers around her like a swarm of bees protecting their hive. She drops the machete and removes her hat wanting to be photographed again. She begins to sing. Riley, a member of the Pedal South Crew producing a documentary of their ride from Alaska to Argentina, catches up to me and mics the women. It was funny to watch. The Indigenous women had no idea what he wanted but she was open to find out. Btw, she keeps a spare pair of underwear in her shirt. She pulled them out as she explained how she washes clothes in the river. As Riley films a boy came to watch. Cameras draw crowds. Rosa Marie attempts to remove an ant from the camera lens. Riley and Rosa Marie pose for the camera. Gallo is a brand of beer in Guatemala. We’re not fans.